The Abada-Capoeira Arts Center on Mission and 22nd Streets isn’t just for capoeira anymore. Dholrhythms, an organization dedicated to building education and awareness of Indian culture, is bringing a little bit of the Punjab to the Mission by hosting Bhangra dance lessons three times a week. Click below to see a video of Dholrhythms founder, Vicki Virk, answer the question – What is Bhangra? Dholrhythms also hosts Non Stop Bhangra, fusing Bhangra with several other forms of music, this Saturday at the Rickshaw Stop. 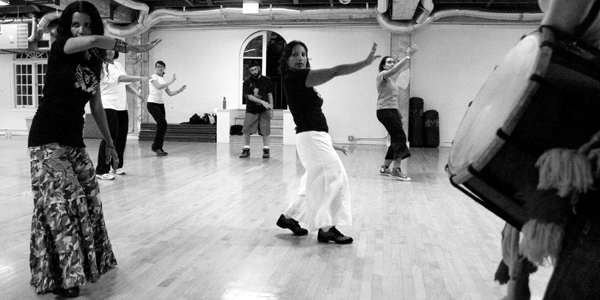 Lessons at The Abada-Capoeira Arts Center are on Tuesdays, Wednesdays and Thursdays from 8pm – 9pm. Armand is a photojournalism and multimedia student at the UC Berkeley Graduate School of Journalism, and is originally from Baton Rouge, La. His work history includes being a paper pusher in Los Angeles and a youth program coordinator in Ramallah, and is currently a student editor at Mission Local, which means he gets to read a lot of news and tell people what to do. He also waits for the day when bacon and buffalo sauce combine on one plate.